#9 Merrimack vs. #14 Maine Hockey East Quarterfinals � Game 1 from Max Collins on Vimeo. NORTH ANDOVER, MA - Elliott Sheen (Lethbridge, AB) notched his first career two-goal game, netting the game-winner shorthanded, as #9 Merrimack notched its first home playoff victory since joining Hockey East with a 5-4 win over #19 Maine in game 1 of the Hockey East Quarterfinals before a sellout crowd at Lawler Arena. Merrimack (23-8-4) and Maine (17-11-7) will square off against Saturday night at 7:30 p.m. in game 2 of the Hockey East Quarterfinals at Lawler Arena looking to advance the Hockey East Semifinals at the TD Garden for just the second time in its history. 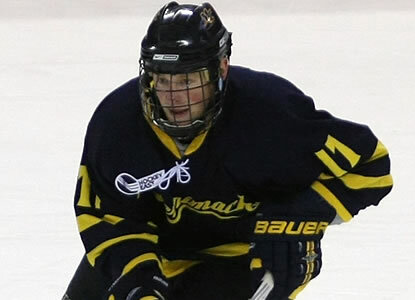 The game is sold out but will be televised live across New England on NESN beginning at 7 p.m.
With the game tied 3-3 with nine minutes to play, Ryan Flanigan (Rochester, NY) gave Merrimack the 4-3 lead with an unassisted tally , beating Dan Sullivan short-side at 12:28 of the third. Then with Merrimack shorthanded, Sheen broke through two Maine defenders at center ice and beat Sullivan glove side on the breakaway at 14:34, extending the lead to 5-3 with what proved to be the game-winner. Maine answered back on the same power play as Spencer Abbott snuck one through traffic from the blue line, cutting the lead back to one with 4:32 to play in regulation. But the Warriors held from there, as Joe Cannata (Wakefield, MA) made four saves down the stretch, including a glove save on Brian Flynn, while his defense blocked four late shots, and Merrimack prevailed with the victory, its first postseason triumph at home since joining Hockey East. Maine led 2-0 early in the second behind goals from Gustav Nyquist and Robby Dee. With the Black Bears on a five-minute power play late in the first, Nyquist gave the visitors the 1-0 lead with his 18th of the year with 41 seconds left in the period. Dee made it 2-0 at 7:02 of the second, getting a bounce off a Merrimack skate and knocking it in for his 12th of the year, but the Warriors responded as Karl Stollery (Camrose, AB) and Chris Barton (Calgary, AB) scored 1:05 apart to even the score at the end of two. At 9:51, Stollery got the Warriors on the board, as the junior backhanded a rebound off a Jesse Todd (Camrose, AB) shot for his sixth of the year and 15th of his career. Stephane Da Costa (Paris, France) started the play, working the puck up ice to Todd, who fired a shot on net which Stollery put home. Sixty-five seconds later, with Merrimack on the power play, Barton capitalized on a turnover in front of the Black Bear net and fired a wrister over the blocker of Sullivan for the unassisted goal, his 14th of the year. Sheen gave the Warriors their first lead at 2:14 of the third, as the line of Sheen, Carter Madsen (Okotoks, AB), and Flanigan successfully cycled the puck, and Sheen finished it off with his fourth of the year. Dee made it 3-3 at 3:52 on the power play with his second of the game, but Merrimack took over from there with Flanigan and Sheen responding with tallies 2:06 apart. Maine was 3-for-5 on the power play, compared to 1-for-3 for the Warriors. Merrimack's third line of Flanigan, Madsen, and Sheen combined for three goals and five points in the win. Both teams fired 24 shots in the game, with Cannata finishing with 20 stops. The victory is Merrimack's seventh straight at home and is the first ever for the Warriors in four chances in the postseason against the Black Bears.